September 24: The new Digital Tangle Journals are released - a big thank you to the great response I had on these, I know they were something new to many of you and I really hope that you are going to find them a useful addition to your digital toolbox (PS, they're still available for the intro price, but not for much longer :) I'm still uploading those deleted images and despite Miss J looking like the side of a bus, we STILL have no new calf, I'm getting worried. September 28 (Friday): Miss J FINALLY has her calf 9 days late but this is o.k. as we are not due to leave for our holiday (our first solo holiday in 11 years) until Tuesday night - 4 full days to be sure all is o.k. with cow and calf before we leave. September 29 (Saturday): I get up early and look up towards the paddock where Miss J and her calf are and know immediately something is wrong. I run up to find that she cannot get up and she has been dragging herself on the ground for metres trying to do so. The combination of her pregnancy happening a little later than ideal, being so overdue, an older cow and the warm, wet weather has created the perfect storm and she has milk fever. This can kill a cow super fast and we call the vet immediately, but she is rapidly deteriorating. Amazingly she is still alive when the vet arrives and proceeds to give 2 injections of a calcium supplement, one in the vein and one under the skin - this normally has an immediate effect and the cow gets up, but things are not looking good, so we pile on the blankets, feed the new baby calf with some thawed colostrum and head out to get more supplies. All morning I am an emotional mess and am convinced the cow will die while we are out as she is in a very bad way. After driving all over, we find what we need, get home, and the cow is still down, but we can see she has attempted to get up again. We give her ketol (a super concentrated sugar syrup) and electrolytes, then reposition her legs and feet again so that they are under her if she tries to get up. About one hour later, John comes in the house and tells me that Miss Jersey is on her feet. We cannot believe it! Many happy tears ensue. This pic was taken right after she got up, still covered in blankets. Miss J is feeding her calf, but is pretty dopey and has caused considerable trauma to both of her front teats. Things look hopeful, though. October 1 (Monday): Miss Jersey is off again, I just know it. She is not really eating and she is very restless. I google and madly and go and talk to the vet again, I get more supplies and when we bring her down to the barn she is wobbling all over the place like she is drunk - I know right then that our holiday (now 1 day away) is not going to happen as initially planned. We start treating the Jersey twice a day with the calcium and ketol. We decide that I will go over with the car by ferry as planned and John will fly in on Friday. We cannot leave Miss Jersey in the condition she is or hand over her treatment to our neighbour. If the hard decision has to be made to put her down, John can handle this......me, not so much. By Tuesday, Miss J is looking much better, eating properly and we are fairly confident that she is now finally, FINALLY on the road to recovery. I head off on Tuesday night and John, fully confident that the cow is now o.k., joins me Friday. We have a great week visiting with our daughter, doing lots of walking and driving all over the place. We have amazing weather with only one day of rain, of course it's when we were doing a tough climb in Cradle Mountain National Park. 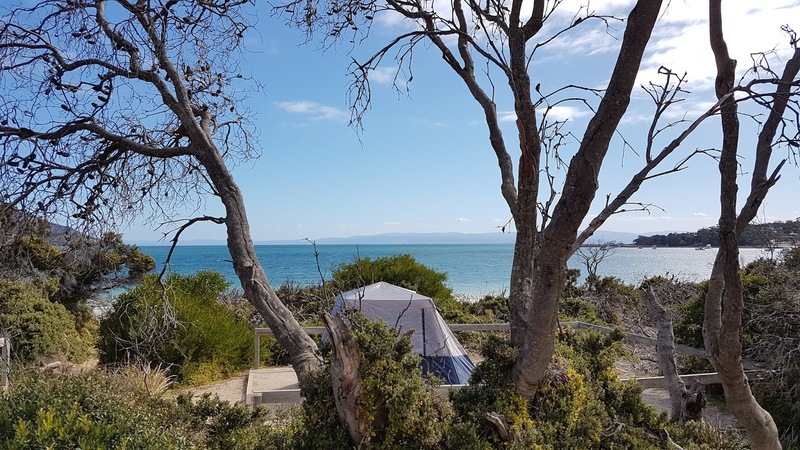 My favourite camping spot - the gorgeous Freycinet National Park. The holiday was just what we needed, AND all of the animals were alive (and healthy) when we returned! YAY! We're even milking the cow - just one teat. The front two are still healing, but as she is at high production we are able to milk about 2.5 - 3 litres of milk from the one and the calf gets the other. 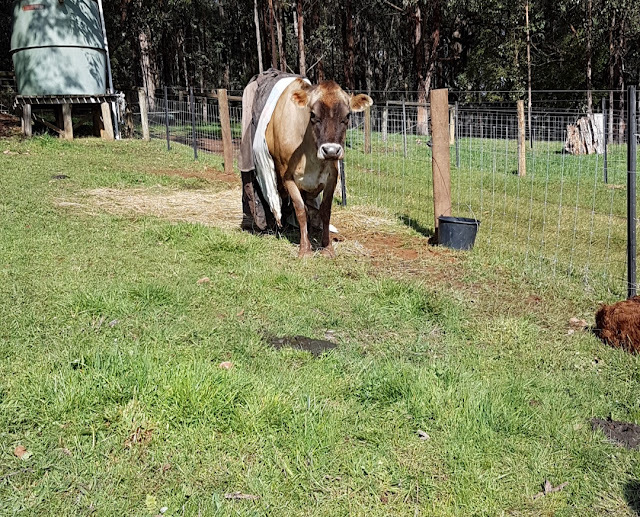 As many of you know, Miss Jersey is very dear to me - I have been milking her for 10 months of the year for over 5 years. We spend a lot of time together and I love her and she, well.....she just likes the fact that I give her food, but that's alright. I'm o.k. with the one-sided love and very happy that, so far, this story has a happy ending. Started with a simple shape - a teardrop stroke, outline, keep building until you have something fun. Well, whew, that's it! Hope you're having a great weekend!! Oh bless you, what a month! So pleased that Miss Jersey is OK - I adore cows so know where you’re coming from! So happy Miss Jersey and her baby are okay. Love your pattern! Have not watched Survivor but wonder if the Gainesville Florida policeman is still there. Wow! So sorry for the angst you had to manage these past couple of months. I know what you mean about loving your animals. Even without conversation between the two of you, there is a bond. I'm happy for you that it is a continuing one. Glad too that you got to have the vacation. My sister is a farm wife and I know how managing the crops and livestock can interrupt the best laid plans. Hope your summer is calmer! Congrats too on the Digital Tangle Journal. What an undertaking! Oh my! The anxiety and worry about Miss Jersey! But so happy she is on the mend and glad you still got some vacation. Your piece is like Sandswirl in a swirl! Love it! I read a lot about cows/calves suffering in the meat and dairy industry, so reading your cow story was like a lot of ketol down my throat. I am sure, it felt like ages until you knew she is over the hill. We, on the other hand, had the luxury to take a peak view at the end of your story just to make sure there is a happy ending in sight (and I don't have to run for the toilet tissue roll). Glad you still have your fav Miss J. and enjoyed a super holiday as well. BTW...does Miss J. get neutered now? Hi Susie, yes, it can be a terrible industry for milking cows which is the primary reason that we milk our own cow (and grow our own beef), I don't want to contribute to that sort of treatment. Miss J has a luxurious life in comparison - we only milk 2 litres a day (instead of around 20), and she keeps her calf with her for 10 months (instead of 1 day). She doesn't even get locked in to the head bail - she walks in, puts her head through and then decides when she wants to leave, as she has plenty of "treats" in the bucket I am done before she is so it works out for us both. Thank you for sharing your story; happy happy that Miss Jersey is doing well after her calving. Having a loved one fall ill is very upsetting, especially if the loved one is an animal (because she can't tell us what is wrong). Good for you for enjoying your holiday and getting your batteries re-charged. May all be well on the farm and with your family. Best wishes to you and yours, always. So happy Miss J and baby are well and that you got to venture out on your vacation. 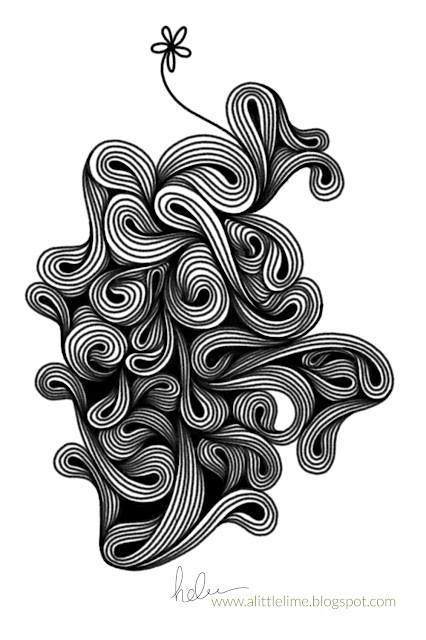 Love the tangle you posted...it reminds me of ribbon candy. Thanks for sharing!